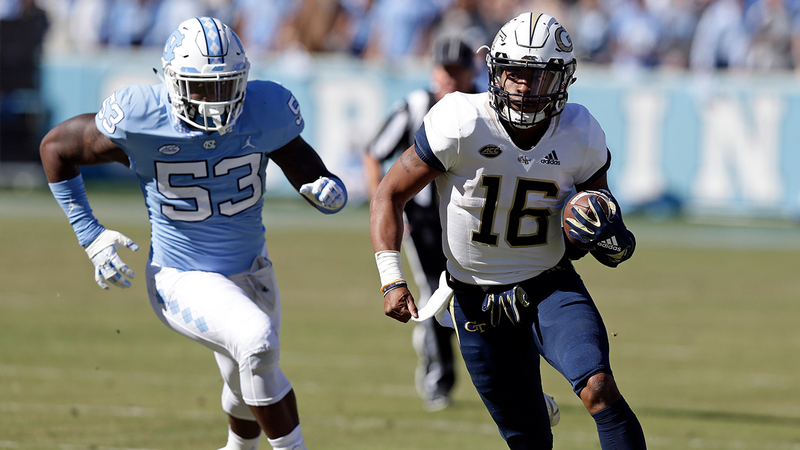 CHAPEL HILL, N.C. (WTVD) -- Tobias Oliver rushed for 120 yards and two touchdowns and passed for a score to help Georgia Tech beat North Carolina 38-28 on Saturday. Oliver broke a 28-28 tie with a 1-yard touchdown run with three minutes remaining for the Yellow Jackets (5-4, 3-3 Atlantic Coast Conference), who won for the fourth time in five games. North Carolina (1-7, 1-5) had a chance to answer, but Anree Saint-Amour intercepted Nathan Elliott's pass with 2:44 left to set up Georgia Tech's game-clinching field goal. Georgia Tech, which entered the game averaging a nation-leading 366.5 rushing yards per game, ran for 461 yards against a North Carolina defensive line depleted by injuries and suspensions. It was the Yellow Jackets' fifth 400-yard rushing performance of the season, a school record. After trailing 28-10 in the third quarter, North Carolina scored on three consecutive possessions, tying the game on a 1-yard touchdown run by Antonio Williams and a 2-point conversion. Cole Holcomb had a career-high 22 tackles and three forced fumbles for the Tar Heels. Elliott was replaced in the second quarter by freshman Jace Ruder, who led North Carolina to a field goal and a touchdown on two drives before leaving with an injury. Elliott re-entered the game and finished with no touchdowns and three interceptions. Oliver replaced starting quarterback TaQuon Marshall on Georgia Tech's fourth offensive series and played the rest of the game. He threw an 86-yard touchdown pass to Qua Searcy, Georgia Tech's longest since 2009. Georgia Tech: The Yellow Jackets moved above .500 for the first time since the season opener, but it wasn't easy. They survived a series of self-inflicted wounds in the second half, sandwiching a pair of lost fumbles around a botched play on fourth and inches that resulted in a turnover on downs. North Carolina: It was another heartbreaker for the Tar Heels, who lost their fifth consecutive game. North Carolina dropped to 5-19 in its last 24 games, a stretch that includes a 2-14 record in conference games and a 2-9 mark at home. Georgia Tech: The Yellow Jackets host Miami, which has beaten them in eight of the last nine meetings. North Carolina: The Tar Heels make the short trip to Duke for their final road game of the season.